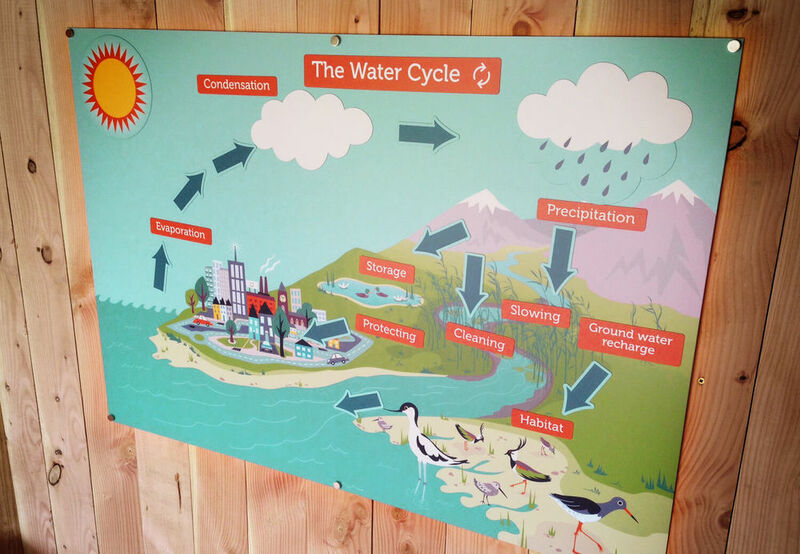 Initially to illustrate The Water Cycle for a new education rain shelter being built at WWT Slimbridge Wetland Centre in Gloucestershire. 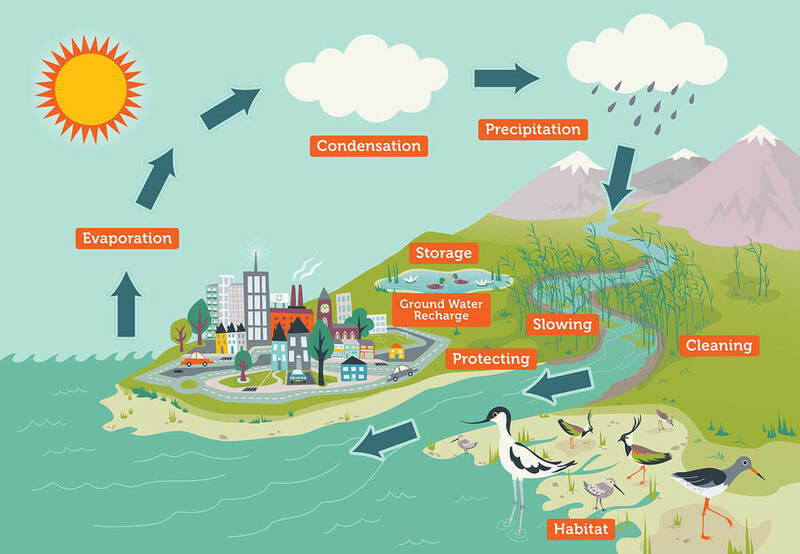 The illustration would be printed large scale (1300mm x 900mm) and was to have removable magnetic elements - sun, clouds, rain, arrows and word labels to promote discussion whilst teaching school groups and allow young learners to add the various magnets themselves. I was later briefed to produce some additional illustrations, also based around water and rainfall. The intention with these was again to aid learning and to allow youngsters to interact by adding moveable elements to each base illustration. Pictured below: a set of images to show how the illustration builds up from the base illustration to depict what happens with increased amounts of rainfall. 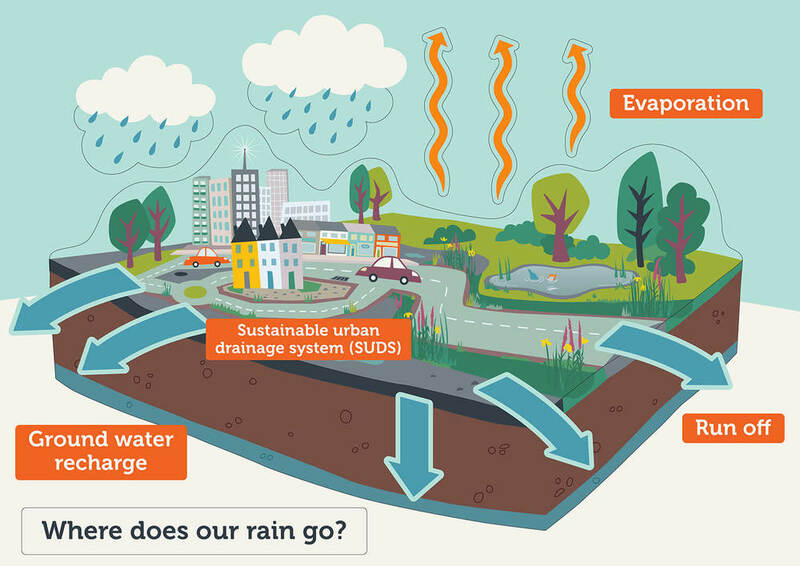 An illustration to help learners discuss and understand where rain goes, and to discover that a lot depends on the type of landscape, be it natural or urban. The natural surface of the sample land section, can be covered with a more urban surface - this affects the level of groundwater recharge and arrows may be placed to show how much evaporation and run off there would be in each scenario. Pictured below is the same illustration in it's different states and with the various additional/replacement elements (printed magnetic pieces). The black edges around the different elements are simply to show the shapes of the add-on pieces. Also a couple of smaller illustrations in the same style. The first is about Swales and is pictured in situ, the second a fun discussion point... Apparently the water that comes out of our tap may be the same water that was once dinosaur wee (?! ), it's just been around the water cycle millions and millions of times. Not sure how factual that is, but designed to capture children's imagination! 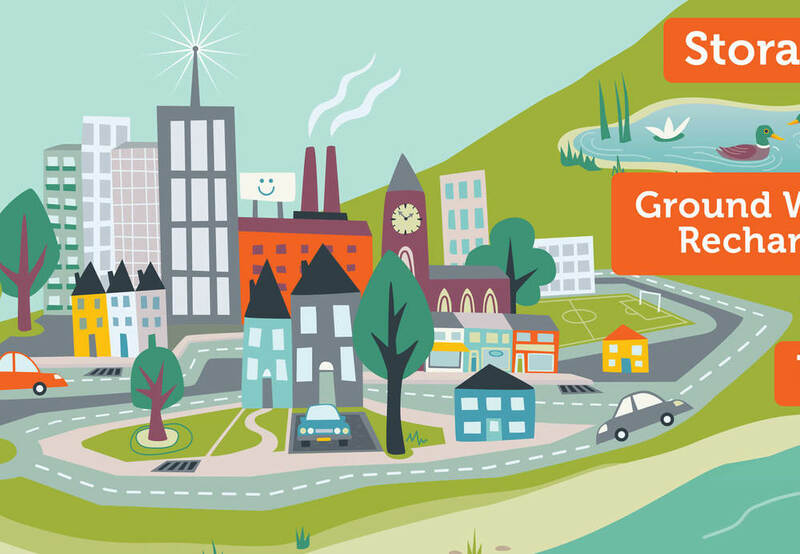 "The new illustrative style Carys created for the Wildfowl and Wetlands Trust is just what we needed; contemporary, quirky, colourful and appeals to all ages. She designs with flare and attention to detail. Working with her has been an enjoyable and easy process."